From St. Louis Post-Dispatch: St. Louis County appears poised to follow the lead of St. Louis and commit $240 million over four decades for an expansion and upgrade to America’s Center in downtown St. Louis. The St. Louis County Council voted 6-1, with Republican Ernie Trakas voting in dissent, on March 12 to advance the measure to a final vote. Although final passage of the bill is on Tuesday’s council agenda, its sponsor, Hazel Erby, D-1st District, said she might table the matter until after the county’s legal staff provides an opinion on whether the project is subject to the county’s minority inclusion requirements. Support from the city and county governments is necessary for the measure to move forward. With scant opposition to the project, it appears to have a clear path. The St. Louis Board of Aldermen voted 21-3 in December to approve the city’s contribution. The measures have the support of Mayor Lyda Krewson and County Executive Steve Stenger. The public support would finance a $175 million plan to expand and upgrade America’s Center. The measure’s supporters say the project is needed to boost tourism and draw more conventions to the city, allowing St. Louis to better compete with peers such as Indianapolis and Nashville, Tenn., which have revamped their tourism infrastructure in recent years by investing hundreds of millions of dollars. The project would add 92,000 square feet of exhibit space along Cole Street and a 65,000-square-foot ballroom along Ninth Street as well as a new pavilion and green space on what is now a surface parking lot. 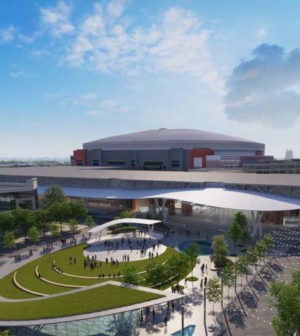 Under the plan, first announced in October, the fund used to service the debt issued in 1991 to finance the Dome at America’s Center — built for the Rams, who left in 2016 — would be used to service new, 40-year bonds issued for the America’s Center expansion. The Dome debt is set to be paid off in 2021. St. Louis and St. Louis County each contribute about $6 million a year to that fund through hotel taxes, and the state contributes $12 million.